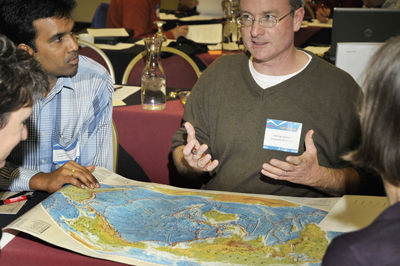 In March of 2010, UNAVCO Education and Outreach staff and collaborators held a workshop to help college-level teachers incorporate geodesy and new teaching techniques into their courses. Teaching Geodesy in the 21st Century - An On the Cutting Edge - UNAVCO Workshop, drew sixteen enthusiastic and engaged professors, teachers, a post doc, and graduate student from around the country to Boulder, CO (Fig. 1). Workshop conveners included Susan Eriksson, UNAVCO; Valerie Sloan, UNAVCO; Barb Tewksbury, Hamilton College; Shimon Wdowinski, University of Miami. Learn more about their contributions below. And be sure to stay tuned for upcoming workshops at UNAVCO Educational Workshops. Using Data in Large Classes – Anne Sheehan led the group through an exercise of mapping velocity vectors across the San Andreas Fault using PBO GPS data. Can you answer the clicker question in Fig. 4? Rolling up Their Sleeves, participants evaluated and critiqued two UNAVCO worksheets (presented by Shelley Olds and Valerie Sloan), providing incisive insight on how to improve them. Then, breaking into groups of three or four, participants took turns evaluating each other’s assignments and discussing potential improvements. In the process, participants were able to find out who might be good contacts for learning more about geodesy in their content area, and so some valuable networking was accomplished. After spending some time individually working on a plan for modifying their own assignment, the group reconvened and discussed which geodetic concepts they thought are the most important to include in introductory geosciences courses (See Finished Actictivies posted on the On the Cutting Edge - UNAVCO workshop website). This workshop was one of the On the Cutting Edge Follow-on workshops which are designed to disseminate themes and outcomes from a larger workshop. This workshop was part of the On the Cutting Edge professional development programhttp://serc.carleton.edu/NAGTWorkshops/index.html for current and future geoscience faculty, and was sponsored by the National Association of Geoscience Teachers with funding provided by a grant from the National Science Foundation - Division of Undergraduate Education. 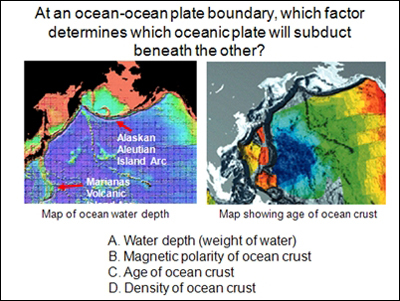 Figure 1 - Michael Kerwin, University of Denver, explains what he hopes his students will get out of a plate boundaries exercise he modified at the workshop. Figure 2 - (left) Vertical GPS site motions with respect to IGb00. Green line shows interpolated 0 mm/yr vertical ‘‘hinge line’’ separating uplift from subsidence. (right) Horizontal motion site residuals after subtracting best fit rigid plate rotation model defined by sites shown with black arrows. Sella et al. 2007. 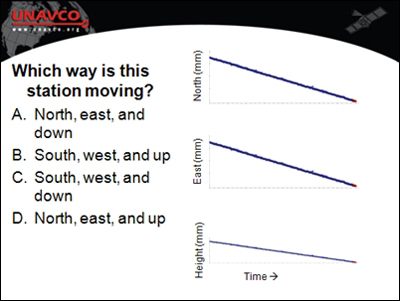 Figure 3 - A slide from the exercise Anne Sheehan (University of Colorado at Boulder) and Shelley Olds (UNAVCO) developed as a part of an exercise on using data in a large class. Figure 4 - An example of a clicker question used in an introductory level geology class.